Robotics. Automation. Artificial Intelligence. Consider how quickly and profoundly these technologies are transforming the way we think, the way we do things and the way we overcome obstacles. Robots and autonomous systems are becoming increasingly pervasive in our lives: from robotic vacuum cleaners in our living rooms to package-delivering drones on our doorstep. From self-driving cars in our garage to high tech robots on our assembly lines. From life-saving devices in our hospitals to underwater vehicles exploring the bottom of the ocean. 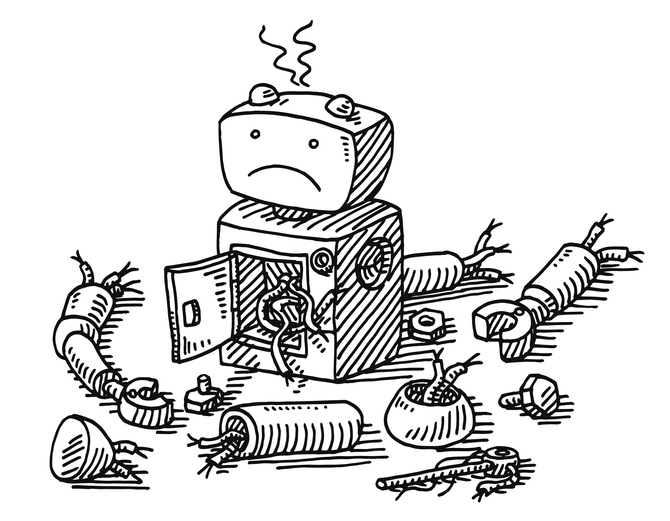 Though some of these applications are not life altering when something goes amiss, if your robot gets a hairball, it will definitely ruin your day. When it comes to precision, let’s hope your robot had its morning coffee. Precision comes in many forms and on many scales. In some cities, coffee shops are relying on automated beverage machines that automatically dial in the correct settings and additives for each beverage on the menu, so orders are meticulously filled each and every time. This leaves baristas free to interact with guests or offer advice on menu items. But, if something goes wrong with the automated system, it could cause the shop to close its doors – at least temporarily. While some would argue their morning coffee is a matter of life or death, some applications truly are. Take healthcare, for example. The first documented use of a robot-assisted surgical procedure took place in 1985 when a robotic arm was used to conduct a neurosurgical biopsy. Fast forward 35 years or so, and we are witness to surgical robots that can perform spinal surgeries with drilling accuracies of within one-tenth of a millimeter. With surgical robots, the main factor affecting precision is the gearboxes in its joints. But what if robots had no joints? What if robots looked like Spiderman’s nemesis, Dr. Octopus, who uses four powerful, mechanical appendages to achieve truly fluid movements? Or, for a more real-world example, check out Tesla’s prototype metal snake charger which finds its way to the car’s charging point all on its own. Could we mimic this movement in medical devices using 3D-printed components? What if we could integrate filtration and flow control capability into such designs to reduce infection or improve patient outcomes? Well, I would argue that, if scientists managed to grow a mouse’s thyroid in zero gravity on the International Space Station using a 3D bioprinter, anything is possible. It’s not just surgery that demands the highest precision and repeatability of movement. Consider manufacturing robots. What would happen if robot kinematics did not deliver pure rotation or movement translation of the computed software equations as designed by the engineers? Whether the driving force is powered by electricity, pneumatics, or other means, accurately controlling the inputs to motion control ensures the robot moves as expected. Think about the impact on pneumatic motion control if proper force or movement is not applied. One can only imagine the product recalls! The principal advantages robots and automation technologies offer are speed and accuracy – two benefits that are absolutely critical to managing costs in virtually every market, including the increasingly competitive markets of raw material production, automotive manufacturing, semiconductor fabrication and laboratory analyses. At the core of Mott’s capabilities is the ability to influence accuracy and precision of pneumatic motion using tried-and-tested designs and modeling in flow control devices and filters. We can also work with you on custom 3D-printed options for integrated engineering solutions that add new feature capabilities to your robotics and automation. OEMs of all types rely on Mott when they can’t afford for things to go wrong. Alexa, when is our anniversary? Alexa, make dinner reservations for two at Chez Andre. Technologies coming to market today are “always listening.” They continuously collect data and most employ artificial intelligence to help make better decisions. In some instances, they can even help save a marriage. Consider today’s high-tech cars that are equipped with sensors of all types. Driver-assistance systems help us park, stay in our lane, avoid crashes and even help steer. But did you know that, since 2014, every new car has been equipped with a data recorder that records and stores more than a dozen specific data points -- seat-belt use, vehicle speed, braking activation, and more? Many insurance companies now rely on this data to establish blame in an accident. Think about autonomous vehicles and how crucial continuous data gathering is. When the day eventually arrives that your car totally drives itself, will it simply book an appointment and drive to the repair shop while you’re toiling away in your office? As all of these things become automated, highly reliable filter and flow components, including computational fluid dynamics, will help ensure data sampling is accurate. The self-driving car needs to be in constant communication with location-tracking satellites and be able to send and receive messages from other vehicles on the road. These cars must be constantly gathering data and feeding it to advanced neural networks to make decisions in real time. It’s a huge amount of data that needs to be protected. As this technology evolves, just consider how critical battery power and data storage will become. Consider manufacturing environments or power plants where production quality is monitored 24/7. The Internet of Things combined with artificial intelligence platforms is delivering predictive analytics as never before. Imagine – you’re a plant manager at a site producing a key chemical ingredient – the quality of which can make or break your company’s reputation. What if your contamination-removing filter was equipped with the latest sensors and could make recommendations to you based on what it’s filtering? “This is filter 19 in sector 3, detecting an increase in PTFE particles. Valve #331 could be reaching end of life faster than expected, recommend preventative maintenance.” Or consider a flow control device controlling purified water flow to your beer processes: “Detecting a shift in mineral and lead concentrations: recommend upstream filter change or contact local water authority.” The applications go on and on, from air quality to hazardous condition detection – getting the right inputs can save lives, your reputation, and your beer. Even healthcare biopharmaceutical technologies are evolving, especially in the manufacture of drugs, which are moving from batches to continuous processes. Future drugs will be manufactured continuously with online sampling to ensure drugs consistently meet quality requirements. Shifts in quality will no longer mean having to discard 10,000-liter batches of drug in the event of an issue. In other exciting advancements, medical professionals are using liquid biopsies in the area of cancer detection to analyze a patient’s blood for tumor cells. Liquid biopsies are less invasive than conventional tissue biopsies and can be used to determine the precise treatment, for example chemotherapy vs. hormonal therapy, for each individual. Imagine the future when your FitBit is able toFitbit can alert you to the first sign of cancer! Critical continuous data gathering technology requires a means to collect and power to operate. What new technologies can be used to collect data? Bringing robot and automation designs to life requires precision components for collecting continuous data as well as powering them. Mott is equipped with a Customer Innovation Center that enables engineering collaboration on-site, ensuring our filtration and flow control know-how translates to the design you need. And, although you may not know us for energy storage solutions, our ability to customize powder metal materials might just help with powering your design’s future. Unmanned aerial vehicles (UAVs). Remotely operated vehicles (ROVs). Drones. Their uses vary as much as the terms by which we refer to them. These days, drones enable scientists to explore volcanoes, help pioneers search for shipwrecks and assist inspectors in examining offshore rigs and underwater pipelines. They help lifeguards rescue swimmers and enable firefighters to battle forest fires. In fact, the Pentagon reported it conducted 11 domestic drone missions during the 2018 fiscal year – as many as it flew during the entire period from 2011 through 2017. Most of these were to support efforts during wildfire season and for emergency hurricane flood response. In addition to protecting the lives of men and women, the military has also harnessed the power of unmanned aerial vehicles for reconnaissance of unknown areas and buildings, to track potential threats and to assist in searches for lost or injured soldiers. Here, failure to operate can literally mean life or death. Deep below the sea, drones and personal remotely-operated vehicles are all the rage, thanks to James Cameron. They are essentially smaller, less expensive versions of vehicles that have been used for years by the oil and gas industry for underwater exploration. Some of these automatons keep watch over divers and, investigate the Titanic and help map the sea floor. Malfunction? Megalodon? A highly engineered design could get you out of a pinch. But what if the future of autonomous vehicles is changing – often to mimic nature or expand upon capabilities. What if drones could also be designed to mimic human actions, perhaps with squid-like tentacles capable of picking things up and holding onto them? Or be equipped with new abilities to collect data, like air quality? With modern-day 3D printing and new material options, the freedom to design for functionality is constrained only by an engineering team’s ability to dream the impossible. Let us help you rid your robot of hairballs – quickly. When precision is mission critical, you want to collaborate with a supplier partner that understands the magnitude of your mission and can respond quickly. We invite you to consider how Mott might help. Take advantage of our Customer Innovation Center to test print that tentacle, to customize flow to make your drug application most effective or, to explore a unique solution to power your drone longer. We’ll help you find a solution in days rather than months. Whether your business is all about robots or drones. Whether you’re focused on precision movement, data gathering and analysis, or bringing never-before-seen design concepts to reality, we’ve got the team, the experience and the imagination to help you imagine the impossible.